New to the forums? Go ahead and register! Why register? Click here to find out the difference of being a guest and a member. After you're done, go here to learn how to start posting. Make sure you've read and agree with the rules of posting here! The forums is run by three administrators. Read here who they are and what you may (and may not) expect from them. Actionsoft's latest game, Midnight Mansion 2: The Haunted Hills, includes 28 mansions. The 8 Built-in mansions have 3 difficulties along with 4 extra custom mansions. We don't have that many other custom MM2 mansions yet. Design your own custom mansion! Info below. You can find out more about the game here. The original Midnight Mansion game contains over 150 mansions. The 8 included mansions which have 3 difficulty levels each, and about 115 approved custom mansions which you can download here and also several freely uploaded mansions. To know the difference between these three types of mansions, click here. Are you a creative person and thinking of designing a mansion yourself? Or want to know about how to upload it? Click here and we'll show you! You'll find guidelines for betatesters here. Midnight Mansion 2: The Haunted Hills version 1.0.2b has been released. This fixes a bug in Jasperlone Mountains Hard. Simply re-download the game, bring over your custom mansions folder from the old version and play on. All your saves and high scores will not be changed. 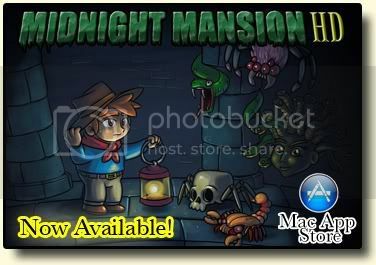 Midnight Mansion HD (MM1) is now available at the Mac App Store and at the Actionsoft website. A Windows version is now available. Here is a list of downloadable MM1 HD ready custom mansions, which also work in the Windows version of the game. The MM2 custom mansion Hanging Gardens of Babylon by Freddy/SandyBean/Josephine was updated on 16 Feb 2014 to add a third section. Questions or remarks about the 24 included mansions in MM2, from Castle Basano Easy to Jasperlone Mountains Hard. Midnight Mansion Forums » Powered by YaBB 2.4!